TidBIT: King Kamehameha II had a vacation home in Ewa Beach. He also mined salt nearby at White Plains in Kanehili. 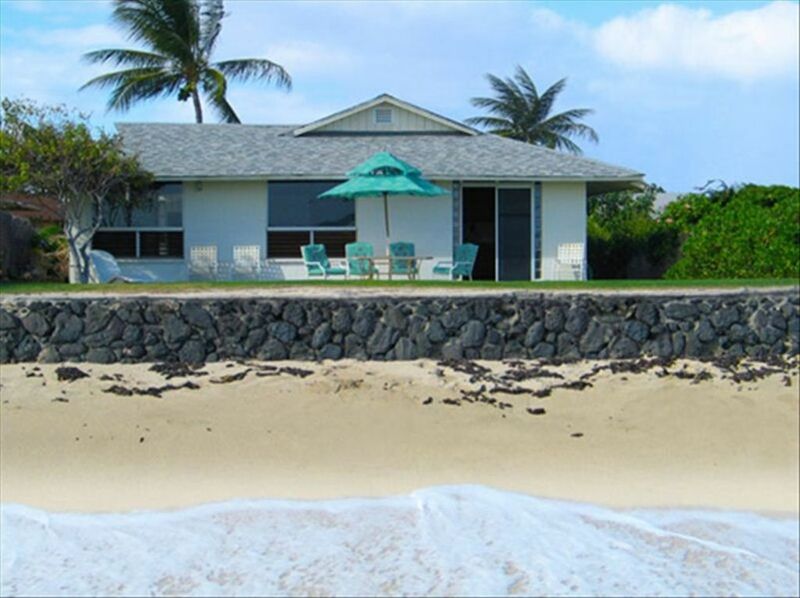 Enjoy the comforts of a private, beachfront home on Ewa Beach Road. Ewa Beach Road has a small, sleepy beach-town atmosphere. Watch endangered birds, sealife, and flora from the lawn or sit with the sandcrabs on the beach. Spend quality family time tucked away in a well-furnished, traditional, beachfront home on sunny Ewa Beach Road with the convenience of shopping centers, banks, restaurants (personal favorite is Russo's coal-fired pizzas), and Hoakalei Resort just a mile away. Get the local experience and have Karen, your host, show you everyone's favorite swimming spot. She can show you the birds she rescues and tell you where to go to see ancient ruins. Our local experience includes ukulele playing neighbors, watching them fish, relaxing on the patio at sunset, and walking miles of natural shoreline. Have a romantic dinner at sunset under the umbrella on the patio. Help yourself to the Rosemary. They make excellent skewers for the BBQ. The kitchen is equipped with microwave, Breville toaster oven, china, crystal, cookware, coffee pot, toaster, blender, etc. All rooms have floor and ceiling fans. There are beach toys in the Hale Menehune (small shed). The master bedroom to the north has a comfortable queen bed and Bedjet climate control system. The children's room on the west has two twin beds. The southwest facing bedroom has a queen-sized bed and Bedjet climate control system. The property is fenced to provide security and privacy. You can join the excitement downtown or sit on the beach lawn and enjoy the Honolulu city lights. The view of Diamond Head is unobstructed. The sunrises are warm and wonderful. The colorful sunsets are relaxing and the moon is cause for song. Come prepared for the sun or stop at any of the convenient stores along the way for sunscreen. Hats and SPF clothing are also encouraged. While you're here, you are our guests and when you leave, we don't ask our guests to do the laundry, so come to relax and enjoy yourselves. Got any questions, please don't hesitate to ask. Hope to see you soon. Christian-owned and operated, smoking is not permitted on the property and the State does not allow smoking on the beach. More than 2 million butts were found on our coastal shores on one day of cleanup. That's twice the amount of food wrappers and containers found on that day. Our shore birds eat the butts and die of starvation. We need to step up and help our environment to be able to continue to be the paradise everyone enjoys. I used to enjoy pole fishing, and in 2004, my friend talked me into accompanying him on a fishing trip in his 16-foot boat. Dinner was great. Today my interests are in rescue work with birds and a few dogs. I'm an active member of Wild Bird Rehab Haven, Inc. and Basenji Rescue. You are on the beach at Ewa Beach with the best view on the island. You can walk miles of natural shoreline. The weather in Ewa Beach is wonderful. The surf is gentle and the waters safe. Songs have been sung for decades about the Ewa Moon and our pearly shells. This is nature at its best. The sunsets on Ewa Beach are so picturesque and relaxing. The sunrise is awesome. There's a freshness in the air and excitement as the day unfolds with discoveries of shells washed ashore during the night. It's fun to make the first footsteps in the sand. One in the master bedroom and one in the hallway across from the bedrooms. Watch the rising of our sea waters as it will sometimes wash over the lawn. New to the area is the Kamakana Resort. This is old Ewa where you'll see sandpipers roam the beach and the soft cooing of doves can wake you in the morning, if the sun hasn't already done its job. You'll see the historic village of Ewa and can ride the old plantation train. Open view of the Pacific Ocean. The southwest side of Oahu. The Waianae Range to the left and Koolau Range to the right. A view across Mamala Bay and Pearl Harbor. A view of Waikiki, Ala Moana, Pearl Harbor, and west toward Waianae. From beachfront to the horizon. The white sands of Ewa Beach. Tandem parking for 2 vehicles. Ice machine in common area. From board games to blocks and puzzles. We are a family of 5 and I took our kids for the first time to Hawaii and they had a blast. The place is great and Karen is took care of us perfectly. The house is a great location out of the hustle and bustle of Waikiki. I highly recommend renting a car and tour the entire island. It is located about 30 mins to an hour of most everything. The only reason I didn't give 5 Stars is because there was no AC. Not that you need it normally, but we just so happen to go when it was extremely hot so it would have been nice in our case. Other than that, the place was great for a family our size. Overall a great place to stay. Golfing, Pearl Harbor Arizona Memorial, Water Slide, Ewa Train Ride, Ko'Olina, Waipahu Plantation Town, Hiking trails, Westlock Shoreline Park, Botanical Gardens and Beach Parks. Ask Bill, our neighbor, about golfing, He's played on all the courses.